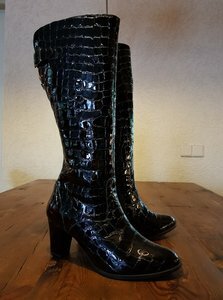 Buckingham is a super elegant boot beautifully finished in mock croc black patent leather. The pig-skin insole is cushioned not just in the heel but right through the foot area for extra all day comfort. Gorgeous patent leather with a contrasting pig-skin lining for ultimate comfort, luxury and style.